Max Shooter ist ein Plug'n Play Adapter und erlaubt es dir FPS Games (3D Shooter) auf einer PS2 Konsole, mit standard Maus und Tastatur, zu spielen. Fully programmable and comes with pre-installed key configurations for the best games available on Xbox or PS2. Advanced features such as Deadzone adjustments and mouse control inversion guarantee best gaming experience with your favorite titles. No software required, just plug it in and enjoy the games! 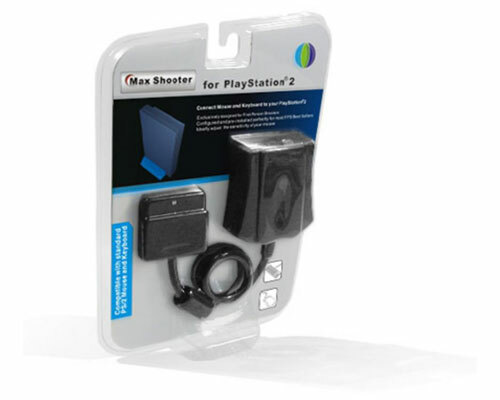 Max Shooter is a plug-and -play adapter that allows you to play the best selling FPS games on your Xbox or PS2 console with a standard PS/2 mouse and keyboard. Dieses Produkt haben wir am Saturday, 17. March 2007 in unseren Katalog aufgenommen.